Today, I had the honor of delivering a keynote address to more than 3,000 content marketers at the Content Marketing World 2015 event in Cleveland. For the first time in my long career as a speaker, I used no slides whatsoever. I just talked about where content marketing is going, and how content marketing professionals can continue to succeed….or fail to do so. 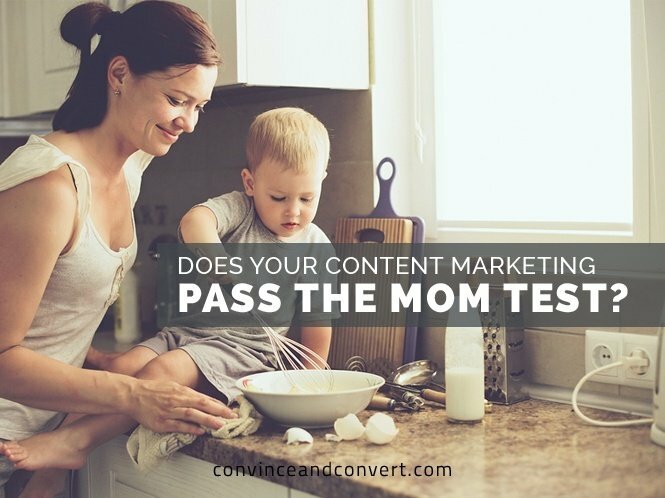 Content Marketing World Keynote: Does Your Content Marketing Pass the Mom Test? We are colleagues. We are peers. We are friends. We are content marketers, and we are at a fork in the road. First, it is remarkable how fast this industry has grown. Just a short time ago, we collectively were just a flicker, and now with the addition of the twin fuels of attention and resources, we are very much a roar! But my second observation is that we don’t need any more content marketers. We have plenty, thank you very much. What we really need – if we are going to sustain this success and take a seat near the head of the table in modern business – is not “content marketers” who are looking to exploit angles and employ sure-fire systems. Building that bridge requires more than budget and an editorial calendar and analytics and a strategy. It requires people who care…no, it requires people who LOVE content and what it can do. Not what it can do for revenue and profits and the reduction of customer churn, although those are nice outcomes. But rather, we need people who love content because it helps a young mother pick the best pre-school, it helps a hospital administrator understand the benefit of a new endocrinology test, and it helps my Mom figure out what cruise line she wants to sail on in Alaska. Content helps people make better decisions, save time, and improve their lives. Creating content is an honor, and it’s an opportunity. It’s an opportunity for you, it’s an opportunity for me, it’s an opportunity for all of us, and I hope you agree….it’s an opportunity worthy of passion. You might be sitting there thinking, who cares? I have a ton of things to get done today, this week, this month, and this quarter. It doesn’t matter if me–or the people on my team–think about content marketing as marketing or as a larger calling. Why do I care if I–or the people on my team–have passion for content, as long as the job gets done. Look around you. More and more and more and more and more smart people are practicing the craft of content. They are getting better every day. And dozens and hundreds and thousands of blogs (including this one), podcasts (including mine), and conferences (like this one) are teaching everyone the same tricks and best practices. If you have access to the same information and ideas that your competition does, and you play that out over a period of time, what happens? Almost everyone ends up in the same, narrow band of expertise. This happens in every professional service, always. Look at laser eye surgery. When it first came out, only a few opthamologists knew how, and had the equipment. They were Gods! Now, you can get Lasik while waiting for a burger at Five Guys. Prices have gone down too, because differentiation has faded away. This is where we’re headed, my friends. And when competition commoditizes competency, what becomes the differentiating factor? What separates the great from the good? What is the difference maker? Right now, we’re still riding the wave. But the wave will crest. I can see it coming, and you probably sense it too. Everything you do and everything you know can and will be copied by your competition. It’s just a matter of time. But they can’t duplicate, they cannot steal if you fundamentally care more than they do. About content, and about content’s role to improve the lives of real people. Do you love content enough? Are you making content, or are you making a difference? And the same way every person older than 14 eventually falls out of love with Adam Sandler, it also easy to fall out of love with content and content creation. I interviewed dozens of content professionals when I was prepping this talk. And what I found, when they told me about their day-to-day existence, was not an environment conducive to passion, but rather a growing set of circumstances–many outside of their control–that conspire to wring the joy and wonder out of the content process. I say yes, too. I see it every day, personally. At my consulting firm, Convince & Convert, we work with companies to help solve these problems, and the one thing I’ve learned is if you love content enough, if you have a passion for it, don’t give up. Don’t get beaten down by the people–in your organization and beyond–who are trying to turn content into a machine. But it’s easy to slip. It happens to me too, all the time. It’s easy to get caught up in the maelstrom and math of content marketing and lose sight of its role as a bridge between commerce and consumer–a bridge that people should actually WANT to cross. So I created a simple filter to determine when I’m slipping. When my focus is shifting from the passion and the people to the procedures and the profits. I use this filter for our clients too, and now I give it to all of you. 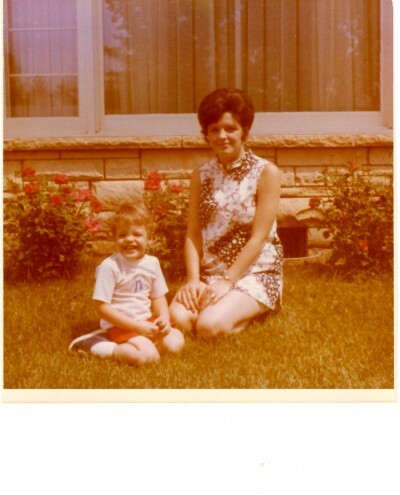 Me and Mom, a long time ago. I call it, The Mom Test. The Mom Test works because for nearly all of us, our Mom not only loves us unconditionally, but also is unafraid to tell us the truth. Your Mom is unafraid to tell you the truth, and if your Mom–who loves you unconditionally–STILL doesn’t like something, NOBODY else will like it either. Check-box checking, just creating content because it was on a spreadsheet to be created. Creating content that they know is low quality, just to get it off their plate. They talked about creating content that clearly serves the need of the company, without thinking about the need of the customers. And let me just say something about that: If you’re crafting a description of your products and services, with photos of them, and bullets points of features and benefits, you haven’t created a piece of content marketing, you’ve created a brochure. That doesn’t pass the Mom test. You know it and I know it. The pros I talked to told me stories about pressure to generate more leads, and to create content that’s too pushy. Putting every stitch of decent content behind a registration form, even though forms are, by definition, the enemy of spread. They talked about content–even in big companies–that is starting to feel like what you see from get rich quick information marketers, with aggressive landing pages and ‘buy now” “limited time offer” messaging. They talked about content that is strictly promotional. Content that isn’t a Youtility in any way, shape, or form. It’s not useful, it’s just an ad, in a different format. Once you understand the Mom test it’s easy to apply it, and it’s easy to know when you’re off course. I want you to start using the Mom test for your day-to-day content decision-making. It works for me, and I think it will work for you. We can always do better. Hopefully the Mom test will help you do just that. But remember, Competition commoditizes competency. Passion is the differentiator, more so than any tactic. It will set you apart. Don’t let your internal politics and the business side of content dim the light in your eyes and the fire in your belly. Because once it goes, my friends, it’s very tough to get it back. Dogs can smell fear, but Moms? They can sense passion. They should know you pretty well. After all, you LIVED INSIDE OF THEM. If you don’t have a burning desire to do this, if you don’t care enough about content, if you’re not in love with what you do, and with the people whose lives you touch every day, then your lack of passion doesn’t pass the Mom test, and you know it. Let’s never forget how fortunate we are. We are literally changing business–forever–every day, in real-time. In how companies communicate, and in how customers research and purchase just about everything, content is having a transformative impact. To be a part of that, even just a little, is a privilege. Baseball players say they are happy they get to play a game for a living. We get to tell stories for a living! We get to interview customers, and make infographics that people look at, and record podcasts that people actually listen to. In a world where everyone who is on Facebook is creating content every time they change their status, we are actually getting PAID to do this. And I think that’s worthy of passion. I’m Jay Baer and I Thank YOU for having a passion for content. And thank you for being part of this wonderful event.